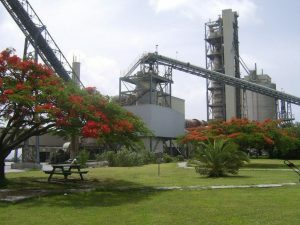 The genesis of the Arawak Cement Plant was the Bergstrom study of 1973, commissioned by the Government of Barbados and Guyana. The feasibility study was reported in 1976, which included details of geological and geo-technical assessments of the proposed limestone, clay quarries and the intended plant site. Due to the subsequent withdrawal of the Guyana Government, talks were initiated with the Government of the Republic of Trinidad and Tobago. The project was eventually approved by both Governments as part of a Bilateral Agreement dated April 1978. The turnkey contract to supply, erect and commission the plant was awarded to the Austrian Company Voest-Alpine in December 1980. Financing agreements were established with Orion Bank of London, in April 1981. Arawak was subsequently incorporated under the Companies Act of Barbados as a Limited Liability Company jointly owned by the Government of Barbados (51%) and the Government of Trinidad and Tobago (49%). In April 1984, the cement manufacturing facility was commissioned and production subsequently began. The plant operated from 1984 to 1991 as a full cement production facility manufacturing its own clinker. The company encountered substantial losses and under an unanimous shareholders agreement, the decision was made to close the kiln. 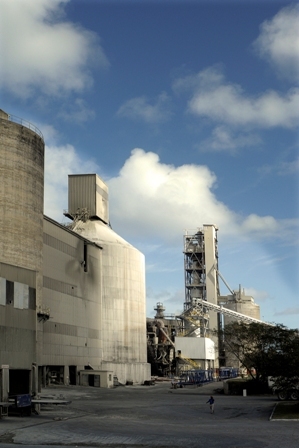 The plant operated as a grinding circuit supplying cement for the domestic market up to 1994 when a decision was made by the owners to sell the company. Arawak Cement Company Limited was purchased by the TCL Group in March 1994. The company was then restructured financially and administratively. A new management approach as well as progressive accounting, human resource and reporting systems, instigated a complete turnaround of financial fortunes within one year. At the same time, work started in earnest on a BDS$13.6 million kiln reactivation project. The kiln was reactivated in April 1997 and the project was an outstanding success, completed within budget and on time. The reactivation of the plant back to a full manufacturing operation, contributed greatly to reducing unemployment. The reactivation also meant that Arawak could re-enter the export market after an absence of six years. The plant is located in Checker Hall, St. Lucy, on the northern tip of the island and very close to the coastline.